It’s an old Irish legend almost forgotten. March 17, St. Patrick’s Day, is the date St. Patty takes the “cold stone” out of the water and it’s time for spring planting. 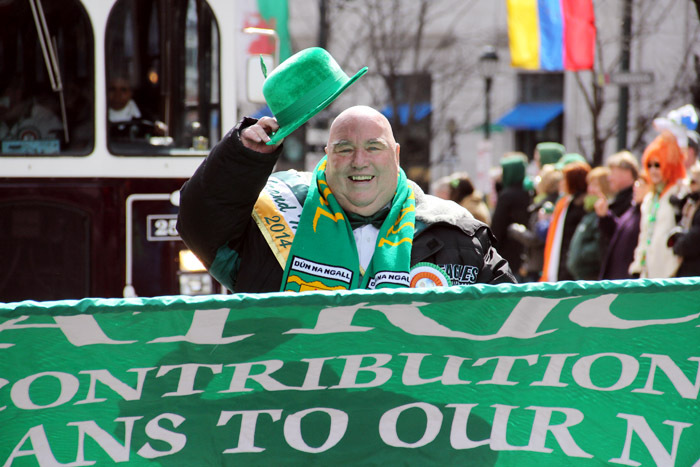 He must have forgotten this year because it was downright cold on St. Patrick’s Day and not much better on Sunday, the 16th, when the Irish of Philadelphia held their big parade. As always the parade was preceded by a Mass celebrated by Archbishop Charles Chaput at St. Patrick’s Church near Rittenhouse Square. And as always it was probably the largest congregation the stately old church will see in the year. Front and center was Jimmy Murray, Philadelphia’s favorite toastmaster, who was Grand Marshal for the parade to follow. That choir he mentioned was the alumni choir of St. James High School, Chester, which closed 21 years ago. Old Bulldogs never forget their alma mater, nor do they forget their mostly Irish heritage. High school bands are one of the favorite features of the big parade, and among them was the Cardinal O’Hara Band with retiring school president Bill McCusker leading the way. Undoubted Irish was Mary Lou MacDonald who marched with the dignitaries as a member of the Irish Parliament representing the City of Dublin. Of course you can’t have a parade without awards, and with a couple of hundred marching units the judges had their work cut out for them. Just to name a few: the Second Street Irish were named Outstanding Fraternal Organization; Bishop Shanahan Cheerleaders and Marching Band were the Outstanding Musical Unit; Rince Ri School of Irish Dance was voted best Children’s Irish Dance Group. Lou Baldwin is a freelance writer, proudly Irish, who lives in Philadelphia. Enjoyed the St.Patrick’s day parade article and the picture of our Golden Bear mascot. It was the St. Thomas More Alumni’s 26 th year in the parade and we also won a Fraternal organization award.